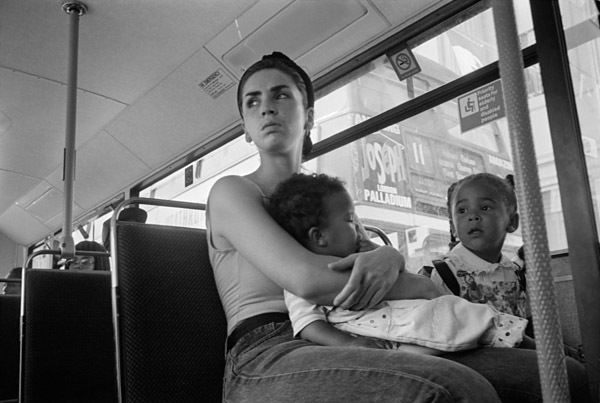 The pictures I saw last week in Seen/Unseen at the Collective gallery as a part of the London Street Photography Festival reminded me of my own very different work on the buses around 20 years ago. 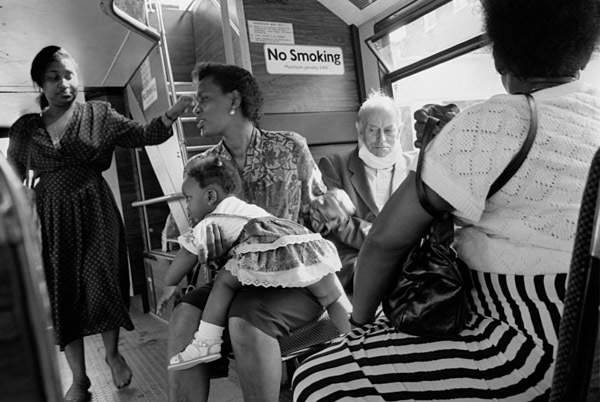 In the early 1990s I was a member of a group of photographers called ‘London Documentary Photographers‘, brought together by Mike Seaborne, which met at the Museum of London, and discussed our work documenting the city as well as working together on some joint projects. One of these was a project on Transport, shown as Transport in the City at the Museum in 1992. 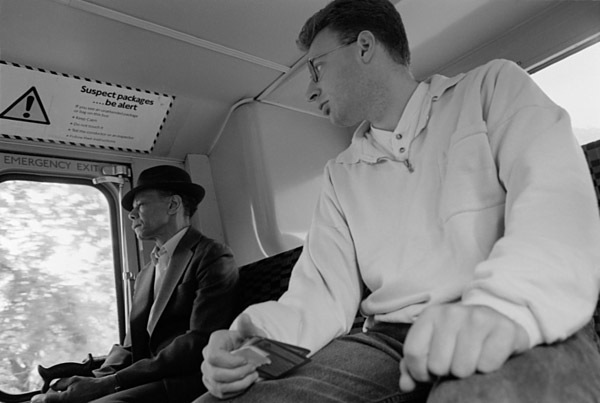 Having admired the work that Paul Baldesare had already been carrying out on London’s underground for several years I decided that I would photograph people on buses. You can see some of Baldesare’s black and white work from that project – with scans that are fairly typical of the web around ten years ago – on the Fixing Shadows web site. He later worked on the project again in colour. 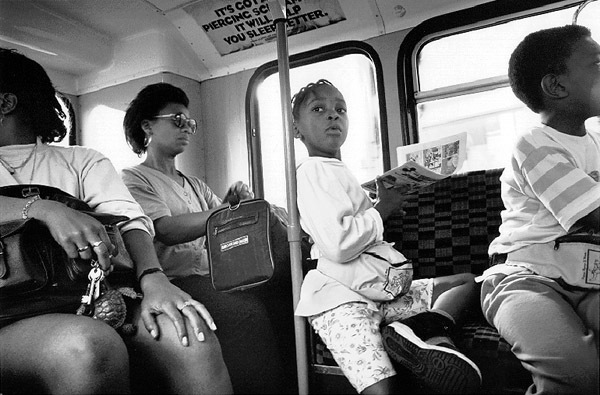 A dozen pictures of my work on London buses – with similar antique scans rather than those here- also went on to Fixing Shadows, where I was the first of several photographers from London. Fixing Shadows was one of the first great photographic sites on the web, founded in May 1995 to champion ‘straight photography’ by J. David Sapir, then a Professor, now Emeritus Professor in the Department of Anthropology at the University of Virginia and for some years the editor of the Visual Anthropology Review. Some people feel that you should only photograph others after asking permission. However, our behaviour in public places is public behaviour and thus, I believe, proper subject matter for the photographer. It is – I was taught as a child – wrong to stare, but these pictures are glances rather than stares. All were taken with a wide angle lens, typically within a few feet of the subjects. Most were unaware of the camera: others choose to ignore it. Asking permission would have destroyed both the events I was trying to picture and the spontaneity of my response to them. Many people – myself included – would generally prefer not to be asked. Just get on with it and don’t make a fuss – preferably don’t let me know. Daily our images are recorded unasked on security cameras on almost every city building and interior. I find the odd guy with a camera far less threatening; at least as a photographer I acknowledge a responsibility towards those who I photograph. I hope none would consider themselves misrepresented. Documenting the way we live is perhaps the most important role of photography. In some ways it would be easier to carry out this project today, although people often say that it is getting harder to photograph on the streets. The cameras I used then were certainly noisier and more obtrusive than some now, and many designed to be used away from the eye. Some of these images were taken without using the viewfinder, and framing then was a problem, which today’s swivelling screens would have greatly simplified. Usually I managed to lift the camera quickly to my eye for a quick glance, but there were occasions when I knew I needed a lower viewpoint, and had to rely on experience and guesswork, shooting either with the camera held in my lap, or on my chest. The other main problem was contrast, with sometimes huge differences in lighting inside the bus and through the windows. Unfortunately some of the best pictures came in the worst weather for this, with bright sunlight outside. Using chromogenic film was a part of the solution, as I found it possible to recover detail from highly overexposed areas, but I learnt a great deal about printing techniques in the darkroom from coping with these negatives, including the use of coloured filters while burning in areas on multi-contrast paper. Again things are so much easier with digital printing, and using RAW on the Nikon cameras does appear in practice to cover a pretty wide dynamic range. I can only remember one occasion on which any of those I photographed objected to me taking pictures. It was an African man travelling wearing shorts and a large snake draped around his upper body, on his way to Covent Garden where he and his snake would, for a fee, pose with tourists. He was off-duty and I wasn’t offering him any money. Before I could really reply to him, two elderly ladies sitting to one side joined in on my side telling him in no uncertain terms that if he got on a bus dressed like that he should expect to have his picture taken. This entry was posted on Friday, July 15th, 2011 at 09:52 am and is filed under My Own Work, Photo History, Photo Issues. You can follow any responses to this entry through the RSS 2.0 feed. You can leave a response, or trackback from your own site. Reminds me of getting the 2/a/b, 196, 159, 59 … between SW16 and Brixton tube to get to school, until ILEA was shut down consequently my free travel card ceased. Thanks. I must look out the whole series when I have a moment, though these are some of the best. I took quite a few around Brixton, plenty of buses there.